A political committee controlled by a top aide to Mayor Catherine Pugh continues to send out flyers advocating Vicki Almond as Baltimore County’s next executive. The Baltimore County Victory Slate, founded and controlled by James T. Smith Jr., Pugh’s director of strategic alliances, authorized attack mailers against Jim Brochin, Almond’s chief rival, describing him as a liar in the pocket of the National Rifle Association (NRA). The misleading flyers were issued last week. 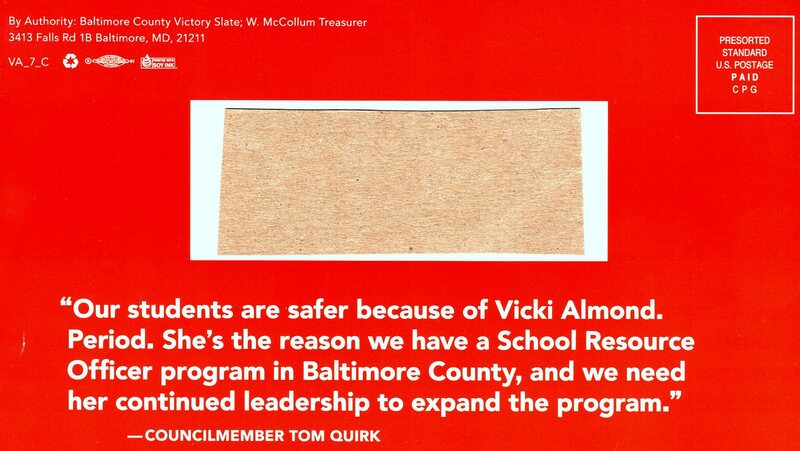 On Saturday and today, the same slate sent out a “positive” mailer touting Almond as the candidate who will keep school kids safe. 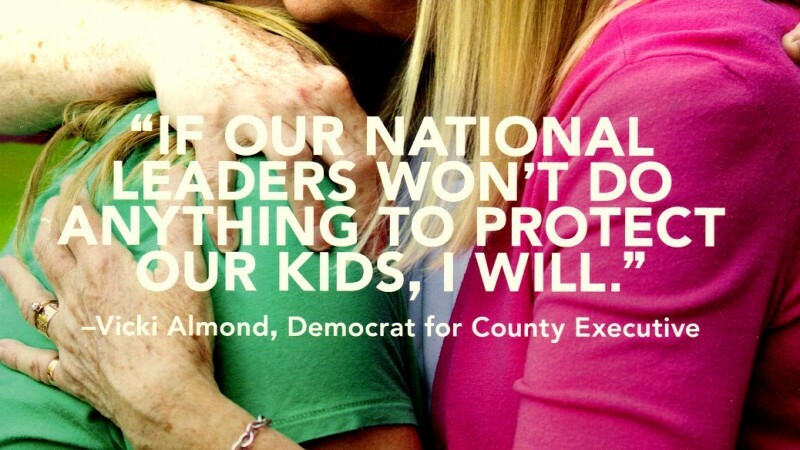 “If our national leader won’t do anything to protect our kids, I will,” the mailer quotes Almond as vowing. 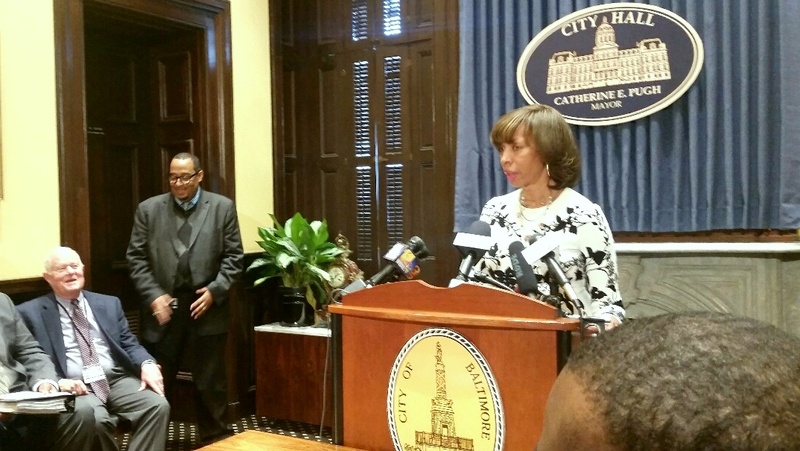 Pugh has not responded to questions by The Brew about whether a high-ranking member of her cabinet should be involved in partisan politics in Baltimore County. Smith’s group was fined $3,000 and given a civil citation for loaning $100,000 to Pugh just days before she narrowly won the Democratic primary for mayor in 2016. The loan was illegal because Pugh was not a member of the county slate and was instead a candidate for a city position. The BCVS was established by Smith when he was Baltimore county executive. It got a $545,000 transfusion of cash in 2014-15 when Smith disbanded his political committee, Friends of Jim Smith. Because Smith had not run for elective office in years, his political committee was reaching the time limit where it had to disburse its money. Typically, retiring politicians give their surplus funds to charities or to other elected officials. In addition to loaning money to Pugh, Smith has used the slate committee to contribute to the 2010 and 2014 campaigns of County Council members Cathy Bevins and Tom Quirk. The slate has also donated to Baltimore’s 11th District Councilman Eric Costello. The Victory Slate reported a cash balance of $354,219 in its latest disclosure report to the Maryland Board of Elections.